(From left) Dato' Dr Dionysius Sharma, Mr Gooi Thin Kwang, Mr Khor Siang Gin and Madam Cheong unveil Mr Gooi's copper tooling artwork 'Arowana' to launch the Art for Nature 2016 Official Opening. 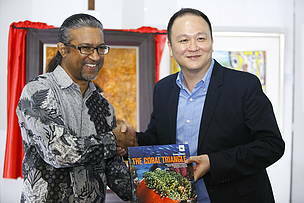 16 January 2016, Penang: The Art for Nature (AFN) exhibition, an annual charity art initiative held in support of WWF-Malaysia since 1997, was launched by Khor Siang Gin, Group Managing Director of Hunza Properties Berhad, at St Jo’s, Gurney Paragon Mall today. 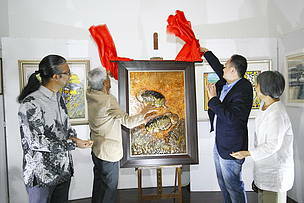 AFN is a unique event for both Malaysian and international artists to showcase their artworks which are inspired by nature. Participating artists include Awang Damit Ahmad, Gooi Thin Kwang, Delwin Cheah, Lim Anuar and Christine Das, amongst others. 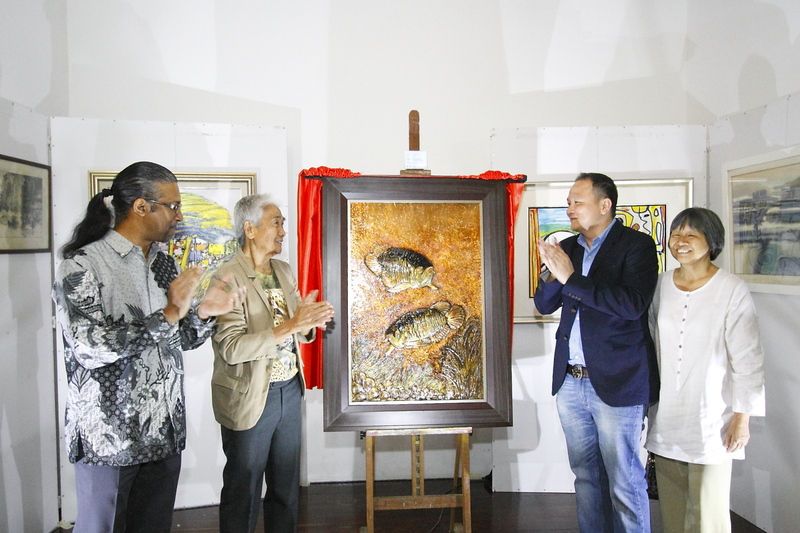 This is the second year that AFN is being held in Penang, and 50% of the proceeds from the sale of artworks will be channelled to WWF-Malaysia’s conservation efforts. Everyone is invited to view the exhibition held from 12 to 24 January 2016, Monday to Thursday from 10:00am to 6:00pm and Friday to Sunday from 10:00am to 8:00pm at St Jo’s, Level 3, Gurney Paragon Mall, Persiaran Gurney, 10250 Penang. “Our natural gifts are priceless, and we should conserve and treasure them, so that our children and future generations can continue to enjoy the invaluable services provided by healthy ecosystems, such as forests and seas – and Mankind would continue to be inspired by nature’s beauty,” he added. Dato’ Dr Dionysius Sharma encouraged the public to view the exquisite and valuable paintings and sculptures at the exhibition. Art collectors would be helping to conserve the priceless and irreplaceable natural treasures as 50% of the proceeds from the sale of artworks will be channelled to WWF-Malaysia’s conservation efforts. Proceeds from AFN 2015 were used for the conservation of marine turtles in Melaka, Terengganu and Sabah. There was considerable work done in advocating wildlife corridors to enhance connectivity for the movement of Bornean elephants in key terrestrial landscapes in Sabah. The funds raised from AFN 2016 will go a long way in advocating improved forest management practices in spaces that support the Malayan tiger and its associated prey species through on-the-ground surveys. The other critical use of the AFN funds would be to advocate stronger protection of important watersheds and catchment areas in Kedah and Selangor. Dato' Dr Dionysius Sharma (left) presents a token of appreciation to Mr Khor Siang Gin. 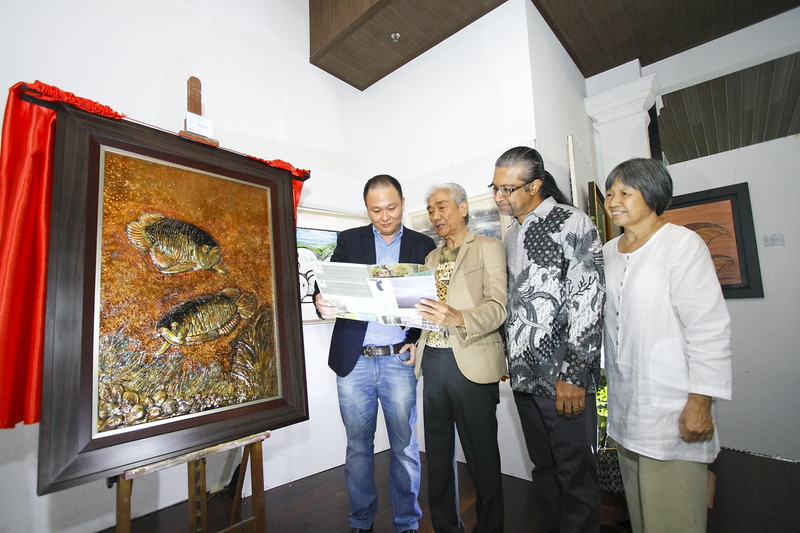 (From left) Mr Khor Siang Gin, Mr Gooi Thin Kwang, Dato' Dr Dionysius Sharma and Madam Cheong view the Art for Nature 2016 catalogue next to Mr Gooi's copper tooling artwork 'Arowana'.